Spa towns in the Czech Republic have history, style and water in abundance. 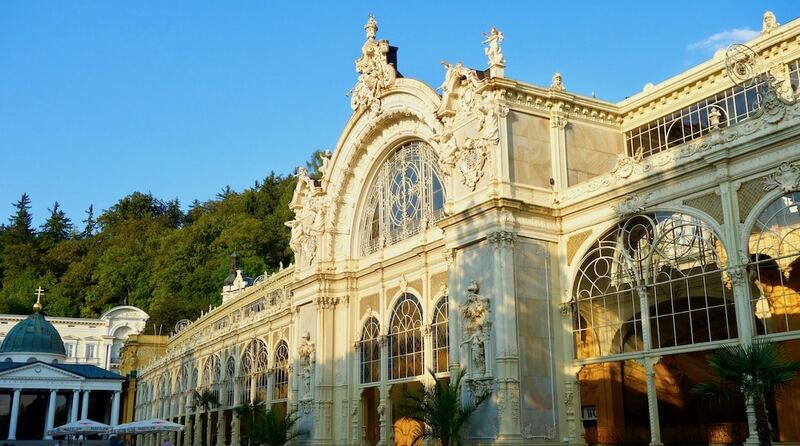 Even if you’re not here to spa, destinations such as Karlovy Vary and Marianske Lazne are some of the best places to visit in the Czech Republic outside of Prague. Here’s everything you need to know about planning a visit. The Czech Republic – Czechia – is a hot destination in Europe, and the hottest places to visit are the country’s elegant spa towns. Literally. The hot springs in spa towns like Karlovy Vary and Teplice are steamy, scalding and sensational. Other spa towns such as Mariánské Lázně and Františkovy Lázně have their fervent fans too – and then there’s always a beer spa. To help you plan your trip, here’s a guide to the best spa towns in the Czech Republic. Czech spa towns can rival any in Europe for beauty, architecture and scenic surroundings – and their spa tradition is strong. 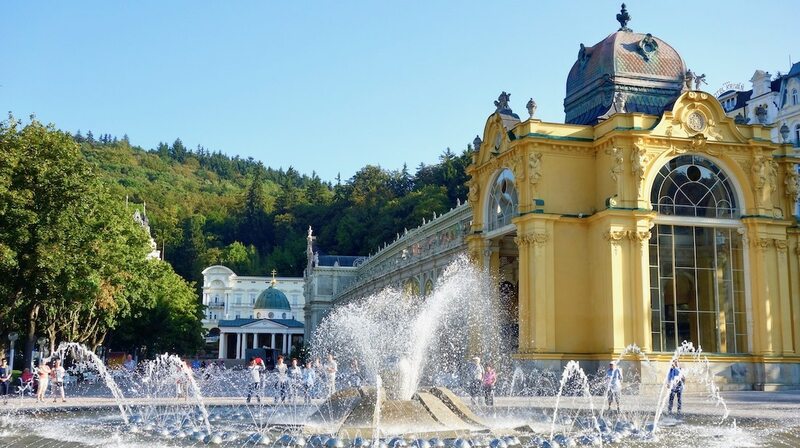 The most popular spa towns to visit are the big three in West Bohemia that make up the Spa Triangle: Karlovy Vary, Mariánské Lázně and Františkovy Lázně. (And just the fact that I know how to spell them shows my love.) 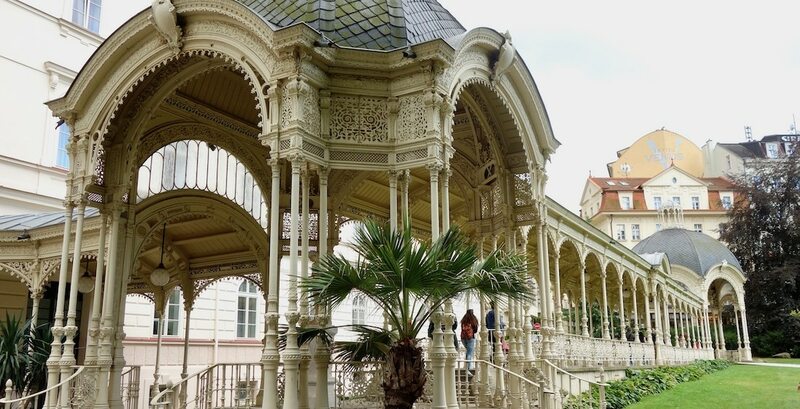 Also known as Carlsbad, Marienbad and Franzensbad respectively, the Bohemian Spa Triangle is just a couple of hours west from Prague, near the border of Germany, and are well worth a visit. What makes these Czech spa towns so appealing? Even if you’re not interested in a wellness vacation they make great destinations and can be done as a day trip from Prague. Think Belle Epoque architecture, elaborate fountains, mineral-rich springs and woodsy nature walks. What’s not to love? In the 19th century, these three towns shot to fame when the European aristocracy descended en masse to ‘take the waters’ and stay at the grand Neoclassical hotels for weeks at a time. At that time they were part of the Austro-Hungarian Hapsburg Empire, a mighty regime that appreciated the benefits of a good luxury spa vacation. Today, the legacy of Karlovy Vary, Mariánské Lázně and Františkovy Lázně lingers on, making the Spa Triangle one of the best places to visit in the Czech Republic. The British King Edward VII had a soft spot for Mariánské Lázně and visited several times. Actually, that soft spot was his bottom – and you can put yours in the same old-fashioned tub in the ornate bathing chamber he once used at the 5-star Nové Lázně Health Spa Resort hotel. Another royal guest to the Bohemian Spa Triangle was the glamorous Empress Elisabeth of Austria, ‘Sissi’, who visited Carlsbad in 1892. The Princess Di of her day, Sissi was a voracious hiker, striding out in the town’s surrounding hills for more then 20 km a day and wearing out the staff members who had to accompany her. 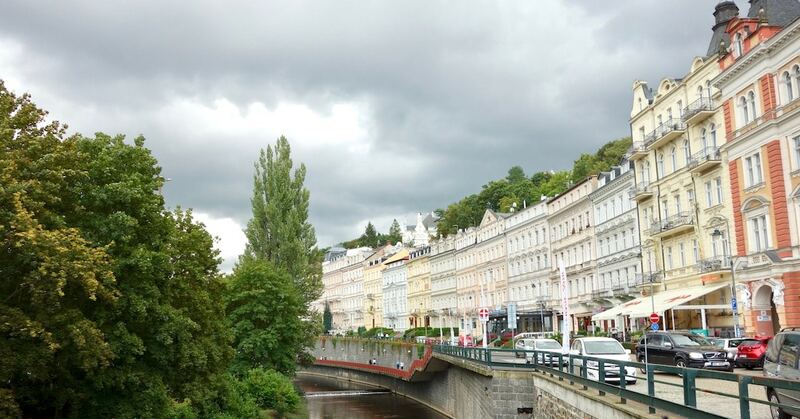 Read more about Karlovy Vary walks. Mark Twain, a visitor to Marienbad, was less enthusiastic about doing a spa cure and described a person’s experience at length. Other celebrity visitors to the various Czech spa towns include Goethe, who fell passionately in love with a younger (and uninterested) woman in Marienbad. Beethoven, Gogol, Paganini, Mozart all stopped by and Casanova spent the last days of his life at the Chateau Duchov outside the Czech spa town of Teplice. The list of illustrious guests goes on. These days most of the celebrities to the Czech Republic can be found at the Karlovy Vary International Film Festival, which is held every July, and attracts stars such as Daniel Craig, Gérard Depardieu and Jackie Chan. Today, spa towns in Czechia (the new English word for the Czech Republic) are appealing more and more to day trippers from Prague and tourists who want to explore, sightsee and hike. They stroll the promenade alongside locals who swear by the spa cure and longterm spa guests from Germany, Russia, Kuwait, Italy, Britain and just about everywhere else. If your idea of hot springs spas in the Czech Republic is steamy outdoor pools filled with thermal water, you may need to rethink your vision. Traditionally, communal hot springs pools are not a thing in the Czech Republic like they are some other European spa towns such as Hungary and Germany. While you might find swimming pools filled with regular water, mineral baths are usually taken in individual treatment rooms. So now let’s take a closer look at what spa towns you can visit. Karlovy Vary is the second most popular place to visit in the Czech Republic after Prague. That’s a pretty good record for a spa town. It was founded in 1370 by the hunting-mad Emperor of the Holy Roman Empire, Charles IV, who was chasing a stag when it leapt into a hot spring. The Emperor’s dog went in after it, cured its injured leg, and the miraculous power of Karlovy Vary’s hot springs were revealed. Or so the story goes. 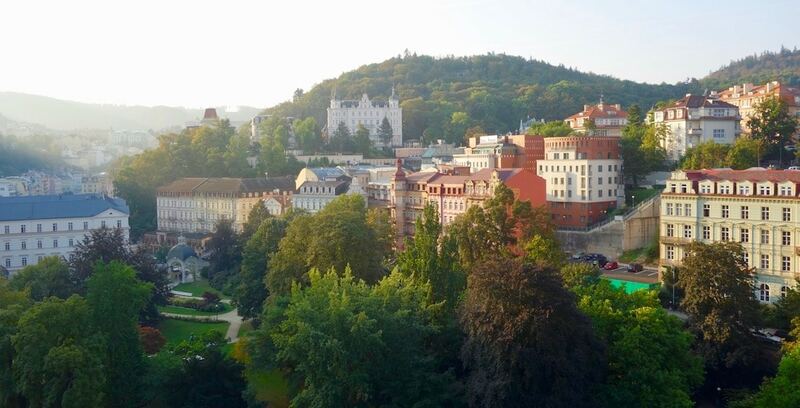 Of all the spa towns in the Czech Republic, Karlovy Vary is the most breathtaking. To my mind only the European spa town that can rival it for curb appeal is Baden-Baden in Germany. Set in a sloped river valley, its main promenade is a sweep of pastel-tinted buildings with the gentle River Teplá ribboning through it like embroidery on a hem. All along the main drag you’ll find lacy gazebos, graceful pavilions and colonnades that house the various springs. There are 12 main thermal springs in the town, and you can wander around with your fancy porcelain spa cup (which you can buy from any souvenir vendor or kiosk) and taste them all. As I’m slavishly devoted to spa water, I think the thermal water is delicious, but if you don’t have a taste for salty steaming water filled with faintly odiferous minerals, salts and CO2, and you’re not trying to stave off metabolic disorders, arthritis, digestive problems or other issues, you’d be forgiven for thinking it’s disgusting. To each his own taste. The traditional spa cure in Karlovy Vary includes a carefully prescribed package of treatments. If you’re interested in a single spa treatment ask at your hotel. Many hotels have their own spa, or will direct you to the right place. One Karlovy Vary day spa that caters to travellers and has an indoor thermal pool is the Castle Spa at Zámecký vrch, 360. There is a lot to do in Karlovy Vary. To quickly sum up you can visit the fountains, tour the Moser Glass Factory, hike in the woods, take a funicular up to Diana’s Observation Tower, shop in the flashy boutiques, sip some healing liqueur Becherovka – known as the 13th spring – at the Jan Becher Museum, or snack on oplatky, freshly-made spa wafers, hot off the grill. For sophistication the luxurious Grand Hotel Pupp is the best hotel in Karlovy Vary. It’s very central, and also well positioned for hiking. I spent a week here once and it was the highlight of my Czech Republic itinerary. Check hotel prices and availability for the Grand Hotel Pupp here. The Imperial Hotel is also quite grand, and overlooks the town. The views are terrific but it does require some uphill walking unless you take a cab or have a car. Check prices here. On a historical note, I just learned that Empress Sisi stayed at the Vila Tereza, which now is part of the Bristol hotel group. It’s located in the Westend Park. Check prices for the 4-star Bristol Vila Tereza here. I’ve also had an enjoyable stay at the 4-star Thermal Hotel Karlovy Vary. It’s a bit of a shock when you see its stern architecture, which is so unlike the Belle Epoque norm in town, but this contemporary hotel is historic in its own special way, offers a full range of spa treatments, has the best views in town and a prime location in the spa park. Bonus: it’s ground zero for the Karlovy Vary Film Festival. Check hotel prices here. Can you do Prague to Karlovy Vary as a day trip? Yes. But don’t take the train. 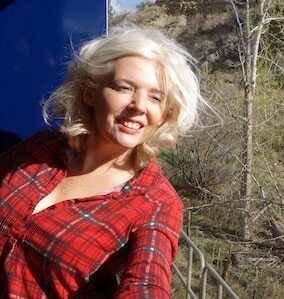 The bus is much quicker. 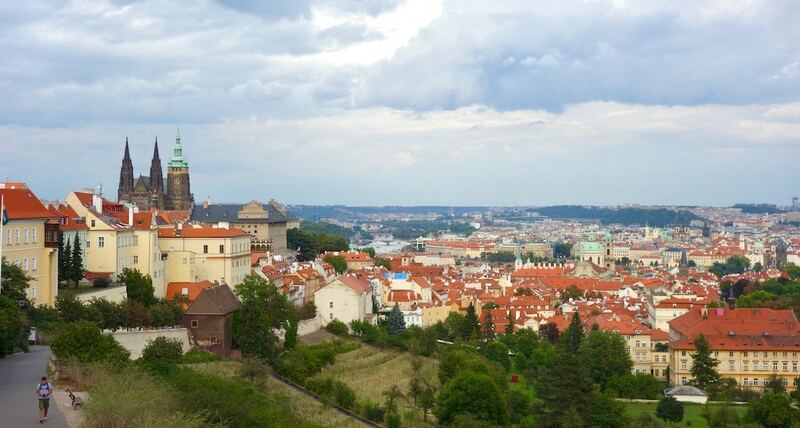 It takes a bit more than 2 hours from Florenc bus station in Prague. To get to Karlovy Vary from Prague by car, take highway E48. Another option to get from Prague to Karlovy Vary is by taxi or private car. I’ve done it from Karlovy Vary when I’ve had to get to the Prague airport early. It’s about a 2-hour drive. Your hotel will be able to book something for you. There are plenty of day tours from Prague to Karlovy Vary. 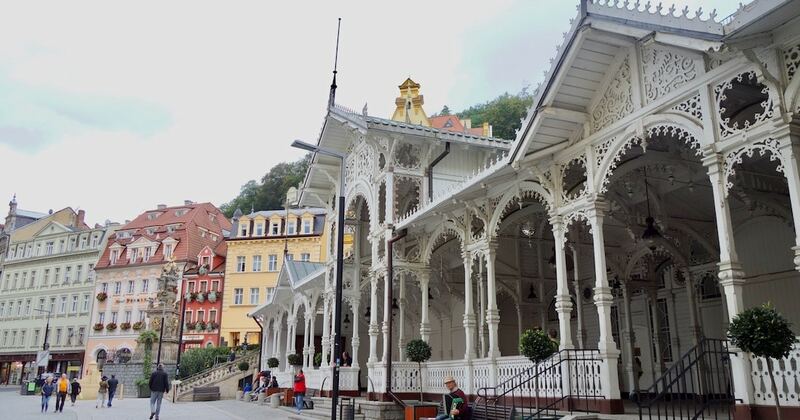 The ‘From Prague: A Full Day Tour’ is a 9.5 hour tour that takes you around the Karlovy Vary springs, talks about the history of the spa town, and includes hotel pick up and drop off. A Prague day tour that includes lunch and a visit to the Moser Glass Factory can be found here. If you want a private tour, you can check out a Full Day Carlsbad and Moser Glasswork tour here. Much as I appreciate the visual impact of Karlovy Vary, Mariánské Lázně – Marienbad – gets my vote for the best place to spa in the Czech Republic. Younger than Karlovy Vary by a few hundred years, it’s not as frenetic, though still very grand, and has come a long way from its days as a swamp. Mariánské Lázně is the second largest Czech Republic spa town, and its buildings are a vision of Schönbrunn yellow, a shade much favoured by the Hapsburg Empire. In addition to its sunny golden glow, Mariánské Lázně has a stunning colonnade and a labyrinth of pleasant forest walks. The Nové Lázně hotel also has one of the most beautiful indoor swimming pools in Europe, a red-pillared beauty from 1896. I’ve stayed here for up two weeks at a time and never got bored. Although other people might. I can’t say it’s a rocking rollicking destination for nightlife. But isn’t tranquility what you want out of a Czech spa town? Unlike Karlovy Vary, the springs at Mariánské Lázně are not naturally hot. They’re still full of minerals though, and there are more than 50 of them. The water here is used to treat kidney problems, digestive system issues, skin problems, breathing disorders and a host of other nasty things. They’re also considered preventative. And who wants problems in the first place? Spa packages are available at almost all of the hotels or you can sample a treatment at one of the spa hotels. What can you do in Mariánské Lázně? You can taste the mineral springs at the Cross Spring Pavilion beside the colonnade, ooh and ah over the Singing Fountain, visit the Chopin Museum, take an excursion to the Soos National Nature Reserve (you’ll need a car or a taxi) or eye the mini historical monuments such as Karlštejn Castle at Boheminium Park. In the winter you can ski at Skiareal Marianky. The top hotel in Mariánské Lázně is the 5-star Health Spa Resort Nové Lázně built in 1828. I spent a week here and if you’re an old-world spa fanatic like I am, it’s a way to recreate the magic of the days of yore. Check prices and availability here. I also did a two-week spa package at the Neoclassical hotel, the Health Spa Resort Hvězda, which spoiled me for life because now I feel like I need to do a two-week spa cure every year. Check prices here. 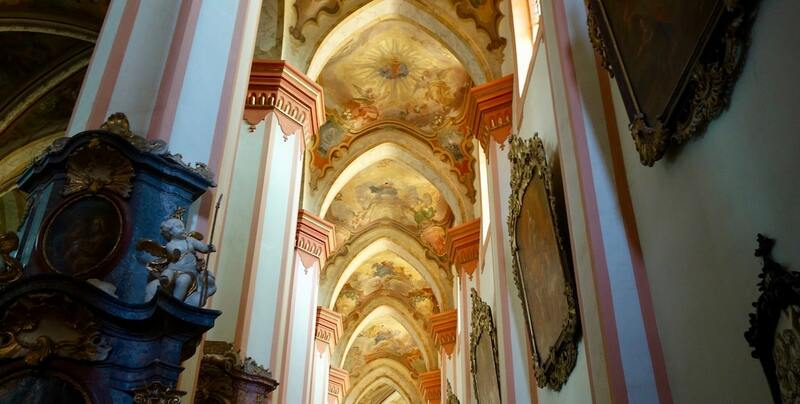 Can you do Mariánské Lázně on a day trip from Prague? Yes. The train takes about 2.5 hours from Prague. 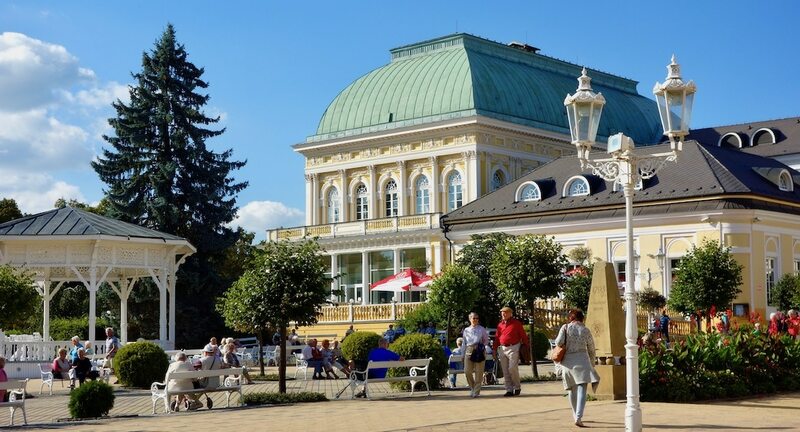 One tour that includes a visit to both Marianske Lazne is the 10-hour Karlovy Vary & Marianske Lazne Tour from Prague with Lunch. Check availability here. It’s easy. Karlovy Vary is about 35 km from Mariánské Lázně. You can take the train, which takes about an hour and a half. It’s also mud on earth. Its peat packs are the pride of Bohemia, and it was the first ‘peat’ spa in Europe. Like Marienbad, Franzensbad has mineral springs which are not naturally hot. There are about 20 springs altogether and they’re said to be good for heart and blood circulation disorders, musculoskeletal problems, and – which may surprise you – gynaecological disorders, including infertility. It’s such a well-known Czech spa for treating infertility that one of its main attractions is the bronze statue of a boy named František in the main park. It’s said that rubbing either the statue’s private bits or the nose (I’m not sure which, because I don’t dare go near it) will give you a leg up (pardon the pun) on bearing children. I did a weekend stay at the Imperial Spa & Kur Hotel, with a full spa package, and the hotel is still getting good reviews. Another Františkovy Lázně hotel I’d consider is the Hotel Pawlik-Aquaforum because it has direct access to the Aquaforum, a large water park with indoor and outdoor pools. Check prices and availability here. Can you do Prague Františkovy Lázně as a day trip. Not easily by public transportation. It’s about 30 minutes past Marianske Lazne by train, and the schedules don’t really jive. Not far from Karlovy Vary is the small spa resort town of Lázně Jachymov. The big event here is taking a radioactive bath. Located at the foot of the Krušné Mountains, Jachymov was the first radon spa in the world. The idea that radon baths are good for the locomotor system is based on the theory that small amounts of radioactive water have a beneficial effect on the body. 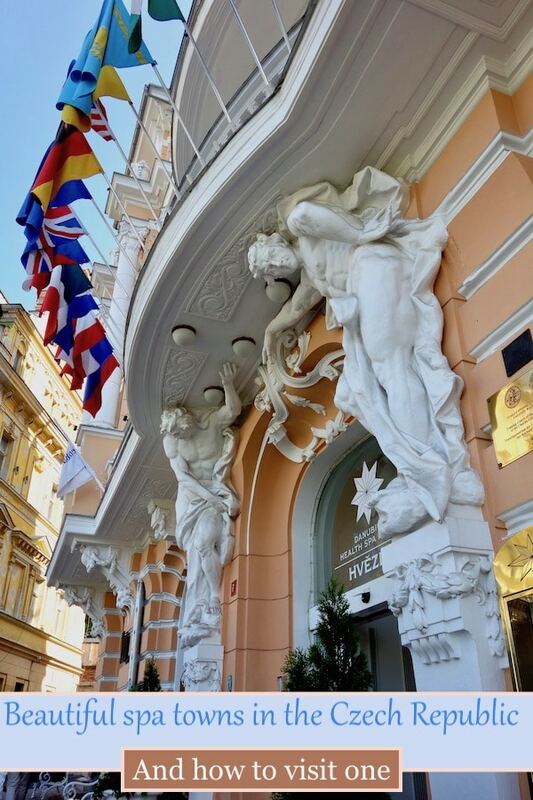 It’s hard for me to get my head around, but both Johann Strauss and Baron Rothschild gave it a whirl, and the luxury Neoclassical Hotel Radium Palace, has been hosting dedicated spa fans since 1912. Check prices and availability for the Radium Palace here. Ninety km from Prague, in the foothills of the Ore Mountains, is the Czech spa town of Teplice. It’s the oldest spa in the Czech Republic and dates back to the Bronze Age. Once known as Little Paris, this spa in north Bohemia was quite a draw in the 18th and 19th centuries, when eminent greats such as Tsar Peter I, the Swedish King Gustav IV, Emperor Francis Joseph I and Beethoven all paid it a visit. The hot springs of Teplice clock in at an impressive 41 celsius, and the spring water you soak in has been winding its way through the earth for 18,000 years. I haven’t done an overnight here, but the 4-star Císařské lázně, the Emperor’s Spa, dates back to 1845 and offers full service packages. So does the 3-star Lázeňský dům Beethoven, Beethoven’s Spa House, which is named for its most famous musical guest. Best of all, the Thermalium in Teplice now offers the largest thermal pools in the Czech Republic. While true spa aficionados might not be beating down the door to get to a beer spa, it’s a cult fav, especially with tourists. The thing is, a beer spa is fun. The Chodovar Beer Spa was the first brewery to launch the beer spa craze. You can sample a dark beer bath, a hops bath, or just visit the brewery and get your beer intake that way. Located in the small town of Chodová Planá, at the foot of the Bohemian Forest, a beer bath is kind of a ‘why-not’ sort of spa treatment. And don’t worry about driving after soaking up a lot of beer, there’s a hotel here too. The Family Brewery Chodovar is located at Pivovarská 107, 348 13 Chodová Planá, Czechia. Check prices and availability for the U Sládka wellness hotel here. In addition to day trips to the spa towns of Marianske Lazne and Frantiskovy Lazne, Tepla Monastery is an ancient monastery that makes a great day trip from Karlovy Vary. The lovely town of Loket is also nearby. I haven’t been to every spa town in the Czech Republic, but I research them endlessly because I’m always dreaming about spa vacations. The problem is I keep going back to my favourite spa resorts in Mariánské Lázně and Karlovy Vary, and it’s hard to branch out. Next on my list is Trebon, a medieval ‘fairytale’ town in South Bohemia that gained a boost of fame after Rick Steves, travel writer extraordinaire, filmed a video here. The fish-raising capital of the Czech Republic, Trebon is known for its historic buildings and artificial lakes created from the swampy muck that once surrounded it. It’s now part of a UNESCO protected biosphere reserve. While we’re on the topic of muck, apparently Trebon’s peat baths are high on the list of Czech spa treatments to aspire to. Luhačovice has been on my horizon for ages. A spa town in Moravia, which is in the eastern part of the Czech Republic, the town is known for its unique architecture style of folk art nouveau. Attractions of note are the Luhačovice Spa buildings, designed by the Slovak architect Dušan S. Jurkovič, and Jurkovič’s House, a pinky brown beauty with picturesque peaks and dormers. The mineral water here, while not thermal, is salty, mineral rich and used to treat respiratory disorders, diabetes and muscular problems. but mostly I want to go because … folk art nouveau. Who would have thought that was a thing? The fact is, most people aren’t going to leave Prague, even if they’re desperate to sample the Czech spa culture. And while Prague isn’t gushing forth with mineral springs, it still has some top spas. For 5-star luxury you can try a Karlovy Vary inspired bath at the Four Seasons Prague, or soak up the divine atmosphere of the Mandarin Oriental Prague, where the spa is housed in a former chapel. I also couldn’t wrap up this article about spas in the Czech Republic without mentioning Prague beer spas, as they’ve turned into a popular attraction. As I said, to me it’s more of a novelty than a medical spa treatment, but hey, who’s to say it’s not effective, and a hop sauna sounds appealing. Plus, it’s not often you get to soak in an oak tub. If you’re looking for a beer spa in Prague, the aptly-named Beer Spa has two locations in the city. Visit their website. When you take a ‘spa cure’ in a Czech spa town you start out with a visit to the spa doctor in either your hotel or at a central spa. Seeing a spa doctor is common in other European countries too, including France, Italy and Hungary. While the thought of seeing a doctor on my holiday used to fill me with fear, now I look forward to working with the doctor to plan a custom-made medical spa holiday. What are medical spa treatments in Europe? In North America we might refer to medical spa treatments as ‘wellness’ treatments. They’re more focused on healing than pampering. In general, Czech medical-based spa treatments (medical wellness) revolve around organic therapies based on natural resources. Think spring water, mud, and natural CO2. They include things like mud packs, massage and mineral-water baths. So when we’re talking medical spa therapies, we’re not talking plastic surgery – though in some expensive high brow spas that might be an option. This traditional type of medical wellness goes back hundreds of years in Europe, and the area of Bohemia in the Czech Republic is one of the best places in Europe to dive in. Visit my Czechia page for more things to do in the Czech Republic. Or go here for more about spa travel. Visit things to do in the Czech Republic for more travel ideas. Or learn more about spa travel. Disclosure: I’ve visited Karlovy Vary, Marianske Lazne and other top Czech spa towns many times. Some were on my own dime and some were hosted by the Czech Tourism Office. 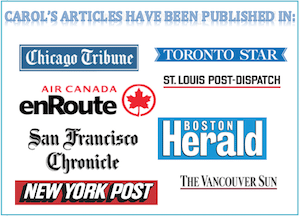 This article is a blur of all my trips, with insights developed over many visits.